I have already posted Pumpkin Sabzi in my earlier posts. Thats for the vegetarians and this one for the non- vegetarians lovers as I have included Prawns in this recipe. When I told my mom during our regular talk over the phone that I bought Red Pumpkin today, her first reaction was "WOW! Are you going to prepare it with prawns?" Thats when I remembered the taste I ate years ago and couldn't wait to prepare this dish. Hubby tasted this for the first time and he too liked it. This can be prepared with fresh prawns or even the dried ones which we get in super markets. 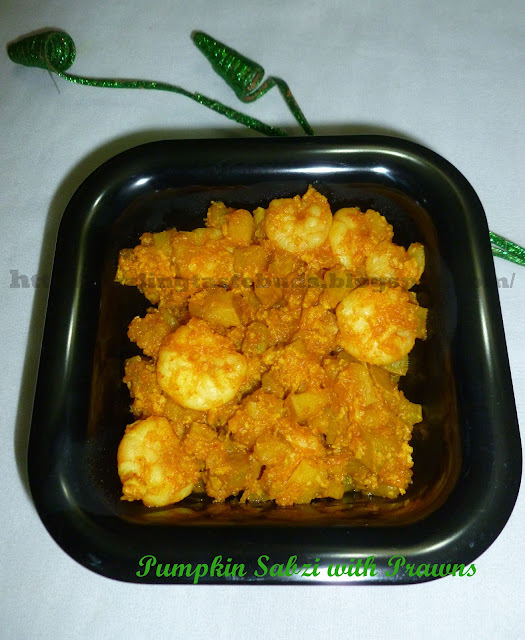 Easy method to cut the pumpkin is given in my earlier post " Pumpkin Sabzi". 2. Add cleaned pumpkin pieces in a kadai with little water and cook till it half done. 3. Add prawns and all the remaining ingredients and cook till pumkin and prawns are done. 4. Serve as a side dish with rice or chapati or any thing you prefer. its my fav.. Thanks for sharing..